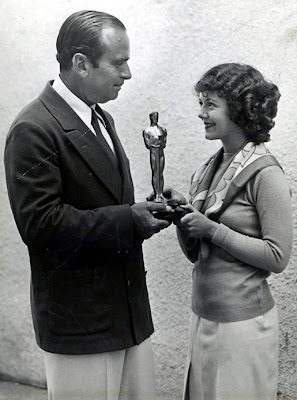 In a win that surprised absolutely no one who attended the 82nd Academy Awards last night, actress Janet Gaynor once took home the Academy Award for Best Actress, making her the first actress in history to win an award in the Best Actress category. Gaynor won the award for films Seventh Heaven, Sunrise: A Song of Two Humans, and Street Angel. The award was presented by Douglas Fairbanks, who called Gaynor "a very talented little lady" and tickled fans by giving her a congratulatory pat on the backside. Nominee Gloria Swanson, frustrated at not receiving the award, died in protest in 1983. When asked about the win, Gaynor said nothing, as she was a silent film star. Janet Gaynor accepted the award in a gown designed by someone who is totally dead now, or a burlap sack, depending on who you ask. "Did you see her dress?" typed one reporter on his fancy new Smith and Corona typewriter, "Did Lon Chaney throw up?" But despite criticism of her fashion choices, Janet Gaynor hoped to pave the way for other actresses nominated in the Best Actress category. "If I can do this, anyone can," Gaynor pantomimed to an amusing harpsichord accompaniment.